Following their magnificent summit success [on Nanda Devi] on September 1, Lou Reichardt, John Roskelley and Jim States descended to Camp 3 the following day. 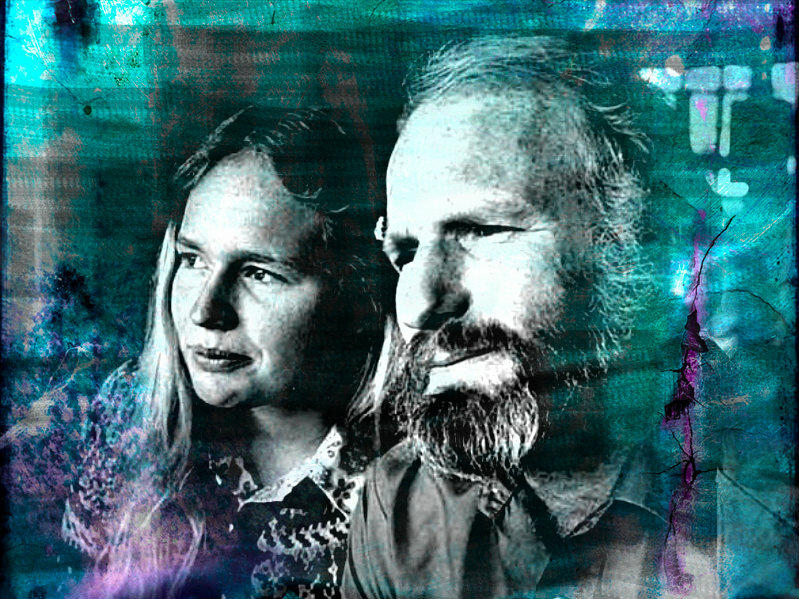 The second summit party of Pete Lev, Andy Harvard and my daughter Devi Unsoeld had been slated to occupy Camp 4 that day, but an ominous black cloud which settled slowly around the summit block persuaded them to take another rest day. As it turned out, the cloud lifted in the afternoon and the day became fine, making it easy for the summiteers to descend to Camp 3. This reunion of our entire expedition was the first we had had since early in the climb, and it was a happy time as we congratulated our successful team members on their outstanding summit effort and heard their account of the difficulties they had overcome above Camp 4. Morale was extremely high. The weather seemed to be improving steadily and two more summit parties were poised for immediate attempts. Rascal (John Roskelley) and Jim both expressed worry about Andy's persistent cough and Devi's current diarrhea and flare-up of an inguinal hernia which had shown up originally on the second day of the approach march. However, Andy had been coughing during the whole trip and Devi had never been slowed by either diarrhea or hernia while carrying between the lower camps. Our situation seemed so ideal that within the next three days both Rascal and Lou headed for . Base Camp — Rascal intending to await our return from the summit and Lou to head out to try to make it back home to join his wife, Kathy, in time for the birth of their first child. On September 3 then, the second summit team headed for Camp 4 while our third unit, consisting of John Evans, Nirmal, Kiran and me, trailed along to carry another tent and extra food to cache. With seven climbers trying to use the fixed ropes at once, the waits were too long and so we four turned back from the top of the third pitch. As we rappelled down the buttress and watched our second team slowly working their way upward, we marvelled at the kind of climbing which Rascal had performed while leading this stretch, going from 5.8 or 5.9 to direct aid and back, and in crampons. At 7 p.m. Pete radioed that he had just arrived at Camp 4 after leaving Devi and Andy behind in order to steam ahead to get the camp ready and water going. At eleven o'clock we got word that Andy had pulled in and that Devi was on the last pitch. It took her until midnight to haul up over the final lip to Camp 4. It had been a long, slow day for her. The next day was brilliantly clear, but the summit party was not in condition to take advantage of it. On September 5 our back-up party of four moved early to join Pete's group for a joint summit try the next day. We set 3 p.m. as the deadline by which we would have to reach the Sugar Delight Snowfield or else turn back. Picking up the cached food and gear increased our packs to dangerous proportions. Kiran and I did not reach the snowfield until around four o'clock and Evans and Nirmal were still a pitch below. The snowfall was increasing and so we were forced to drop our loads where we were and retreat, despite Kiran's protests. As it was, we didn't reach Camp 3 until 9 p.m. and all four of us were dragging from the effort. September 6 dawned clear and bright, and since I felt remarkably strong despite our previous day's exertion, I decided to go all-out and join the party at Camp 4 for a summit attempt. They had radioed that Pete had made a reconnaissance yesterday to halfway to the summit before turning back in the bad weather. Kiran and Nirmal were too tired to make another effort so soon, and Evans was wiped out by an illness which later turned out to be the onset of hepatitis. The familiar ground flowed smoothly past under my jumars until I reached the snowfield. I was elated to see that to the mid-point it had taken only two-and-three-quarter hours actual jumar time. There I added more food and a tent from the cache and put on my crampons for the traverse into the gully (called 'Spindrift Alley' by the first party). My pack was very heavy now, but I found the beauty and boldness of the route totally exhilarating. The 400ft. of the gully were a ghastly slog with no certain footing in the depth of sugar snow which had accumulated. The final pitch to the lip at Camp 4 was 200ft. of vertical going with occasional small traverses to attempt to keep the rope away from the nastier rock teeth which protruded from the wall. It was a definite relief to heave myself over the snow lip at the top. September 7 was a pure blizzard at Camp 4 and none of us moved from the tent. It was a day full of liquids and the easy talk which fills rest days at high altitudes. 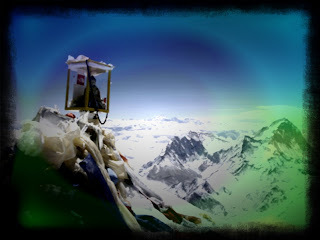 Devi was feeling better, but was still quite weak when measured against the energy output required for the summit try. It was decided that she should wait at Camp 4 while the rest of us made our try and then descend with us the same day to Camp three.However, that night was a bad one for Devi. Her stomach gener­ated gas in such quantities that she simply could not sleep and spent most of the night sitting up to belch it forth. By morning she was extremely tired. Because of the high winds and continuing snow, we decided to head down at noon and wait for better weather in the relative comfort of Camp 3. Pete, Andy and Devi had now been at 24,000ft. for nearly five days. We were packed for departure when at 11.45 a.m. Devi was suddenly stricken. She had time only to say with great calm, "I am going to die," before she lapsed into unconsciousness. We tried mouth-to-mouth resuscitation, but with no sign of success. Within fifteen minutes I felt her lips growing cold against mine and I knew that we had lost her. We continued our efforts to revive her for another half hour without result. As the enormity of our loss slowly sank in, the three of us could only cling to one another for comfort while tears coursed down our beards.